Today we continue our story of the attacks during the Battle of the Somme on the first of July 1916. We continue our journey south by looking at the attacks of the third and fifteenth Corps of the 4ths army in their attacks from just north of the village of Ovillers to just north of the village of Mametz. Today we continue our story of the attacks during the Battle of the Somme on the first of July 1916. We continue our journey south by looking at the attacks of the third and fifteenth Corps of the 4ths army in their attacks from just north of the village of Ovillers to just north of the village of Mametz. Also, I highly recommend anybody who hasn't head over to the website at historyofthegreatwar.com to check out some of the maps, which I probably should have been mentioning during all of these episodes. It would be in this area of the front that the British would start seeing some real gains from the efforts put into the attack. Up to this point our story has been all about the British just beating their heads against the wall that was the German lines, throwing men at the defenders without having anything to really show for it. From here on out that narrative changes and the British will start to actually take and hold onto some gains. All of these gains would be less than hoped, and they would still pay dearly for them, but they would be actual square yards of territory taken by the attack. Because of this our story will undergo what I think is an important change from why did the attacks not succeed at all to why did they not succeed as much as planned. I also get the feeling that as we move south, there is generally less knowledge about what happened, there is generally a lot of discussions about where the British failed completely, but then by the time you get to the French areas of the attack there is often very little in English accounts. One more thing before I get going today, consider this your 4 week warning to get questions into the Episode 100 question and answer spectacular. You can contact me on any of the various social media platforms that the podcast is on or you can just go with a more direct method and email your questions to historyofthegreatwar@outlook.com. Oh, and I have some thoughts about doing some charity things over the next few months, so if anybody knows any great international, or at least large scale charities relating to the war, please let me know. We start our story today with the events of the Third Corps. 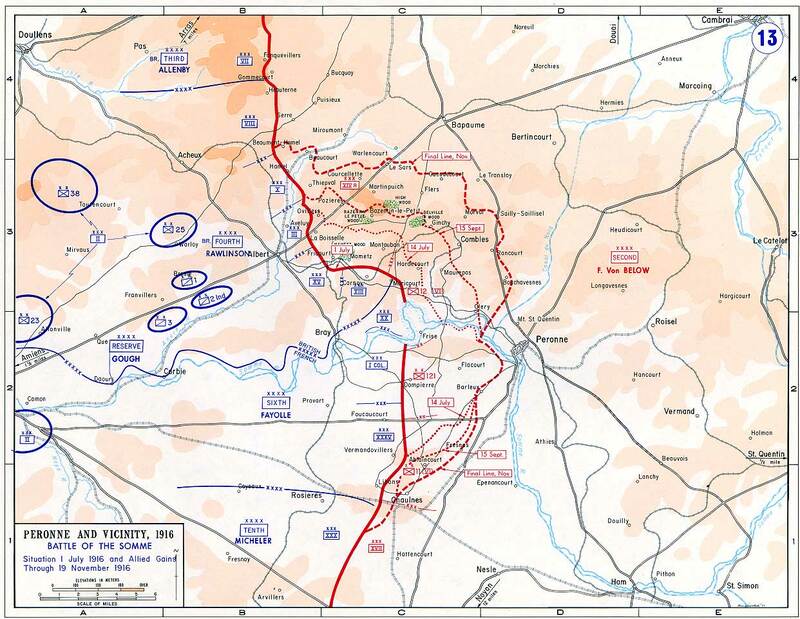 The task of the Third Corps was a tough one with the goal of pushing through the German positions just south of Pozieres and then through the village of Ovillers. After they had accomplished this task they would then push through the German second positions between Contalmaison and Mouquet Farm. You can forget those last two place names, that is the last time they will be said today. The two divisions of the Third Corps were the 8th and the 34th and there were two types of reasons that the position for their attacks was problematic, the first set of problems was geographical. 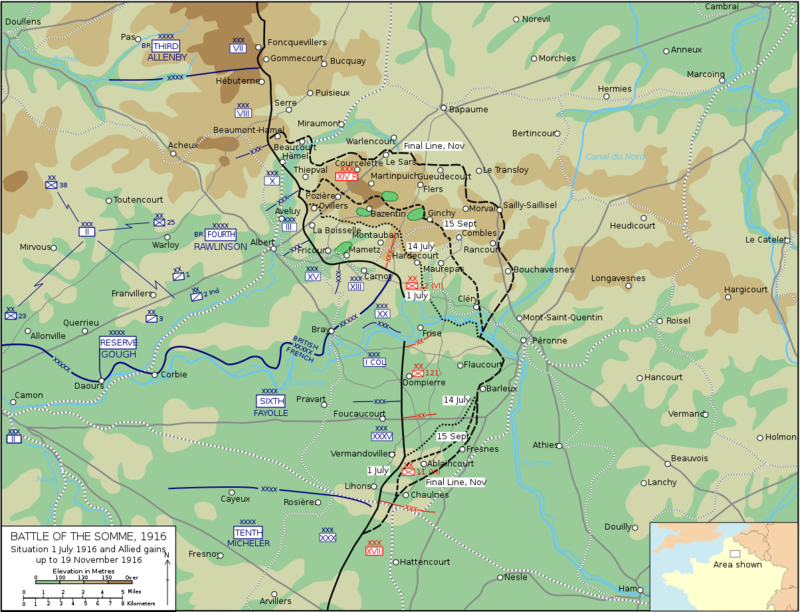 The first being that all of the positions of the British, where they would be starting the day, were overwatched by the Germans on Thiepval Ridge. This would allow them a commanding position against any attack, an attack that could not really in any way surprise them. This position would be even more commanding if the attack of the 10th Corps to the north did not meet their objectives and we already know that those attacks did not go as planned. The second geographical problem was due to the fact that No Man's Land was extremely wide, in some areas it would be 800 yards wide, which is about 730 meters for those in the world outside the United States. This is an absurd width of area that the British troops would have to try and advance over while being under fire from the defenders. On top of these two geographical problems was the fact that the British themselves had just made everything more difficult for the two divisions. The first way that they did this was by sending every drop of strength from the two divisions forward in the first attacks. All six brigades that they had at the front would be involved in the opening attacks, or in closely following it all up. This gave them no ability to react to any setbacks, or even any successes. The second problem was, in what I am sure you are getting tired of hearing, their plans for the artillery, especially the heavy guns. Last episode, and the episode before that, we talked a lot about the problems that the British attacks experienced when the artillery moved off of the German first line right when the infantry started their attack. In front of the Third Corps they took this mistake to a whole new level. The plan was to not even wait for the infantry to attack but to instead move all of the heavy artillery off of the Frist Line a whole 30 minutes before the attack started, leaving only the lighter guns to fire on the German lines to try and keep their heads down while the infantry went forward. All four of these problems, two of them intrinsic to the area of the attack and two created by the British themselves, would compound on each other to make the situation for all of the infantry basically impossible. The 8th Division probably had it worse though, since they were in the more difficult position. It was on their part of the front that No Man's Land was the widest and they would also be advancing up mash Valley and if either attack on their flanks failed they would advancing up the valley like fish in a barrel. Their commander even took the steps to try and get his attack delayed slightly, just to make sure the positions on the flank was taken care of before his men went forward, but this request was denied almost out of hand. On the bright side, if somehow the infantry of the Third Corps was successful in their attack there were cavalry units just waiting to capitalize on it by moving forward. I think its probably pretty clear at this point though that this cavalry would not have much to do. When the time came for the attack on July 1st the 8th division experienced nothing but a series of failures. The men had been told that there would be "no need for this short rushes and getting down on your stomach, go straight over as if you were on parade" and just like at every point before this faith in the artillery was ill placed. The men went forward, with as much bravery as they did anywhere else but there was simply nothing that could really be done. Most of the men only got a few steps before they were forced to either seek cover or be hit by German fire. Reinforcements followed up closely behind the first waves but experienced pretty much the same problems. Throughout the entire day more and more British troops of the 8th Division would try to go forward to reinforce those that they thought were in front of them, they of course did not fully understand that so many in front of them had already fallen. Here is a quote from one of the men who tried to go forward in the later waves "It was impossible to stand at all in No Man's Land and the Battalion crawled forward on hands and knees to the help of the Battalions in front." All through the day British observers behind the front tried to figure out what was happening in front of them, pretty much to no avail. All that they could see was a confusing mass of smoke and explosions as German artillery blanketed the area between the lines. They were straining to try and see some sort of evidence that the British troops had gotten forward and taken the first set of German trenches, but this evidence was not to be found because they hadn't. While the least fortunate were always those soldiers who were killed, close behind them were those that had been wounded and found themselves stuck between the trenches. These men, like Private Ernest Deighton found themselves in a very unenviable position. They were often wounded to the point where they could not easily move forward or back, and especially when they were injured early in the day their only choice was to try and wait it out in No Man's Land, trying not to draw attention to themselves. Here is Private Deighton of the King's Own Light Infantry discussing his ordeal after he had been injured early in the attack and found himself several hours later stuck in a shell hole with 4 others, all of which were in a similar state. He recalls his feelings as night began to fall on July 1st. "When night came I were in a deuce of a state. I must have been fainting off and on, what with the loss of blood. You'd no idea of the passage of time. I didn't know where I were. I only knew there were Germans in front and Germans behind and I had no idea which way were the British lines. What with having nothing to east and nothing to drink all day, my toungue was getting as big as two. I could hardly close my mouth. What worried me was getting caught in our own shellfire. I bothered more about that." 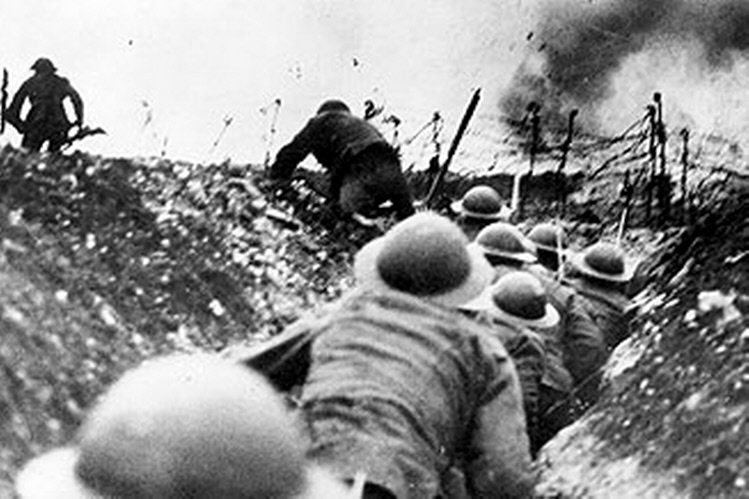 There are stories similar to Private Deighton's all along the front, of men being stuck in the danger zone of No Man's Land all throughout the day, unable to move but the entire time in pain or in a daze, sometimes drifting off and passing out without any knowledge of whether or not they would wake up on the other side. Some were lucky enough to make it to nightfall at which point they had a better chance of finding their way back to safety. Many were not able to survive that long. The 34th was another of the New Army divisions being used for the attack and their job was to try and capture the La Boisselle Salient. The plan was to send the division forward in four columns to close in on their objectives from several different directions. Much like in other places the troops were assured that the artillery had done all the hard work and the village that they had to capture had been completely destroyed when they began to move forward. Once again the German dugouts and defenses were not at all destroyed and were in quite a good state. However, in this area, like some others, the artillery was not the only tool that the British had to deal with the German positions, they also had put a large amount of effort into the creation of two mines. There was one called the Y Sap mine which had 40,000 pounds of explosives and the other called the Lochnagar or Schwaben Hohe mine that had 60,000 pounds of explosives, definitely not messing around. The large mine was setup under the Schwaben Hohe Redoubt, not to be confused with the Schwaben Redoubt that we discussed last week. The Y Sap mine was positioned to help the 102nd Tyneside Scottish who had to advance up the very dangerous Mash Valley. Private Harry Baumber of the 101st Brigade of the 34th Division had a great view of what happened when the Y Sap min exploded "The mine went up and the trenches simply rocked like a boat, we seemed to be very close to it and looked in awe as great pieces of earth as big as coal wagons were blasted skywards to hurtle and roll and then start to scream back all around us. A great geyser of mud, chalk and flame had risen and subsided before our gaze and man had created it. I vividly recall as the barrage lifted temporarily and there was just the slightest pause in this torment, several skylarks were singing – incredible!" The crater from the explosion was somewhere around 270 feet wide and 70 feet deep. Unfortunately for the British infantry, while the mine explosions were impressive, they did not solve all of their problems. For the Y Sap mien the Germans had some foreknowledge of what was going to happen and used that to evacuate the area before the mine exploded, avoided all of the possibly harmful side effects like death by obliteration. The mine under the Schwaben Hohe Redoubt did cause more damage, but it did not completely put the German positions in the area out of commission. For the Tyneside Irish, they still have to cross the wide open areas of Mash Valley, regardless of how well the mines worked or did not work. This involved trying to dodge the German fire from Ovillers and La Boisselle, this became especially hard when Ovillers was not captured or neutralized by the 8th Division. All along the 34th division front the men who went forward found themselves in an unwelcoming environment. Here is Private Baumber again as he describes what happened when he tried to move forward with his unit. "It was akin to striding into a hailstorm and the further you went the less and less became your comrades. Jerry had not been obliterated, his wire had not been destroyed and we had been called upon to walk 800 yards across No Man’s Land into Hell. A far cry from the walkover we had been promised." Regardless of the fire, at a few different places the attackers were able to get across No Man's Land and start taking some of the German positions, but even in the easiest of areas, like those around the mine craters, it was still no cakewalk. Here is Lieutenant A. Dickinson to discuss "When we arrived at the crater, our orders were to man the top, round the lip of the crater. Of course the Germans they soon played their machine guns on that lip and first one would get one through the head and roll down, then one after another would roll down into that bottom which tapered down to a point. It was still hot as an oven after just being blown up." It soon became apparent that some huge lunge through the German lines was not going to happen, however unlike in other areas this did not meant that there were not real gains being made. This was especially true on the far right of the 34th Divisions area of front, here real progress of consequence was made, which I believe if our first to discuss in any of these episodes. Unfortutunately for the men who were able to make these gains, it was against extremely difficult to try and get reinforcements and supplies to them however, all through the day and into the night their held their newly won ground. Throughout all of the afternoon, evening, and night officers worked hard to make sure that the men held onto their gains and make sure they spent whatever energy they had digging in and getting ready to repel counter attacks. Miraculously they were also able to meet up with advance units of the 21st division on their right which was a great omen for longer term stability and success. While these gains had been made, that did not mean that for both the 34th and 8th Division July 1st was not a horrible failure. Total casualties for the day were 6,380 for the 34th division and 5121 for the 8th. The casualties for the 34th were, I believe, the highest for any single division on July 1st, and unfortunately it was due to their success that they experienced so many losses. It was here once again true that the units who achieved a little success were far worse off than those that had simply been checked at the start line. To the south of the 3rd Corps was the 15th Corp, under the command of Lieutenant General Henry Horne. He and his troops faced two more important spurs running down the Pozieres Ridge these being the Fricourt and Mametz spurs, with villages of those same names on top of them. These two villages had been turned into fortresses by the German defenders with a series of deep dugouts and a well-developed set of trenches to keep everything together. However, it was very apparent that the defenses in this area were not as robust or strong as those further north. This would not have been enough for the British to succeed though, the positions were not that weak, but when combined with a few advantages that the 15th Corps had that other units to the north did not have, well, good results would follow. The first advantage for the British was simply in the terrain, the German positions were generally lower and on the forward slopes of the ridge in this area. This was combined with the fact that the British had a pretty good rise behind their lines, giving them much better vision of the Germans than at any point to the north. The liens were also far closer together on this part of the front, making it safer and quicker for the infantry to attack. Another factor in the Brits favor was the fact that the bombardment in this areas had far more effect than other areas and in fact the preliminary bombardment had caused a good amount of havoc among the German defenders. There had also been a far more concerted focus on counter batter fire from the artillery of the XV Corps. This focus was combined with the fact that that XIII Corps and the French also put a far greater focus on the use of counter battery fire to give the German artillery all along the front from here and to the south a good beating. This would not make the attack easy, but it just might make it possible, at least for the first series of objectives. And these first objectives were for the 21st division on the left to capture Fricourt and for the 7th division on the right to move against Mametz. On the north side of the attack near Fricourt a good gauge of how well the British attack went for a specific unit was to simply look at how far away they were from Fricourt. In general the units that were attacking directly against the village were in for a very rough time, but the further away from the town the unit was the better off they were. Most of this revolved around the amount of machine guns in and around Fricourt and the areas of the front that they focused on. 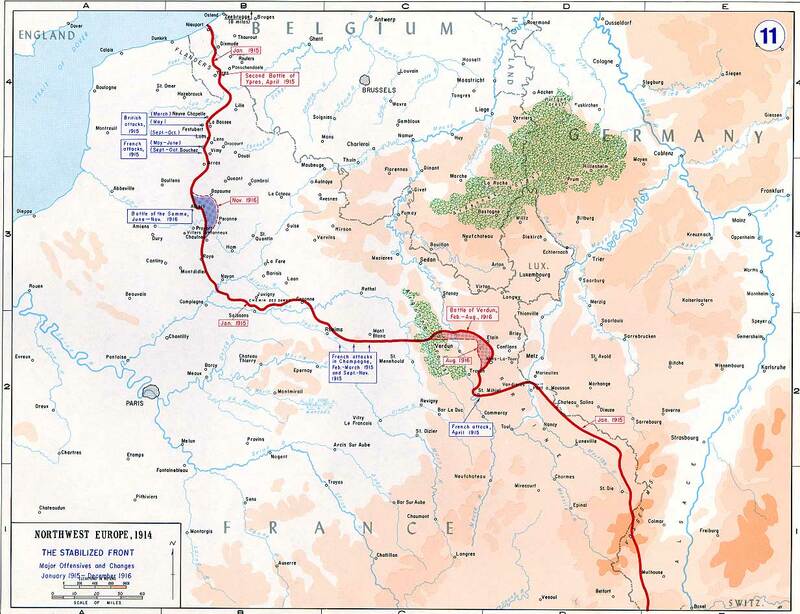 On the far left of the 15th Corps' front two of the Brigades were able to push into the German lines, even though they were under fire both from Fricourt and from German positions to their north. On the right of Fricourt the 22nd Brigade was able to make it both forward and then into Fricourt itself, although it would be unable to fully hold onto its gains. Already, you can see that this is going a bit better than to the north. The real gains though, came from the right side of the front and the 7th Division. Here the British attack quickly began to gain momentum and make real progress. By the middle of the afternoon the village of Mametz itself was fully secured by the British and the men had been able to advance just beyond it to establish a new defensive line. This was a huge accomplishment. For these gains the 21st Division had suffered 4256 casualties and the 7ths had lost just 3,380. This is a great example of how important counter battery fire was during these battles. Because it was given a greater focus by the units in this area of the front, and to the south of it, not only were gains easier to secure, but reinforcements and supplies were actually able to have even the smallest chance of getting forward. Sure there were other mitigating factors, like the German line in this area being weaker, or maybe placed less optimally, or maybe the geography was just not as much in favor of the defense. However, if you look at the gains made on July 1st they almost directly correlate with the focus and effectiveness of the counter batter fire on that specific area of the front.